Hallux valgus, commonly known as bunions, can be very painful and frustrating. Your big toe can move more and more out of place as time goes on. This can affect your other toes, eventually making it hard to walk normally. Fortunately, you don’t have to live with bunion pain and problems anymore. 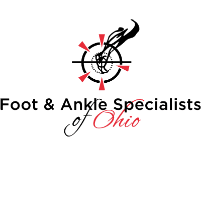 The expert podiatrists at Foot & Ankle Specialists of Ohio in Mentor, Chardon, Westlake, and Geneva, Ohio, are here to help. Schedule your appointment online or by phone today. A hallux valgus, commonly called a bunion, is a bone abnormality that occurs when your metatarsophalangeal joint, the one at the base of your big toe, grows sideways to become much larger than normal. The bunion can push your big toe inwards, putting pressure on the other toes. In severe bunions, your big toe can even overlap your second toe. Bunions are a major foot issue because they can cause pain, and can sometimes make it impossible to wear shoes comfortably. Women are more likely to suffer from bunions than men, and footwear is the likely cause. Wearing high heels or any other shoes that compress the toes can greatly increase your chance of bunions, and women are much more likely to wear such shoes than men. Genetics can play a role in bunion development, too. If your immediate relatives suffer from bunions or other foot-structure problems, your odds of getting them increase. Chronic medical conditions like osteoarthritis can lead to both bunions and hallux rigidus, which causes a stiff big toe. Bunions don't go away without treatment, so it's important to see your podiatrist at Foot & Ankle Specialists of Ohio as soon as you notice the bunion growth. During the outpatient Lapidus fusion procedure, your podiatrist fuses two key bones in the big toe together. This prevents your big toe from moving abnormally and helps it stay straight to prevent a bunion recurrence. The Austin bunionectomy is an outpatient bunion-removal surgery. Your podiatrist removes the bunion and makes a small bone incision in the main big-toe bone. Then, your podiatrist moves your bone into the proper position and secures it there. Usually, a couple of tiny screws permanently hold the toe in position. During either of these bunion surgeries, you'll be pain-free thanks to anesthesia. If you've got bunions and just want them gone, book your appointment online or by phone today.